In MCASD’s newest collection, we’ve discovered what San Diego had to offer during the 1960-80s’ inclusion of art within a political narrative. So what about campus today? Read more to find out other impacts of some of the pieces you may have passed by, but never quite pondered. Iconic to the engineering buildings at Earl Warren College and a remarkable feat of architecture, design and visual imagineering, the Falling Star home is nestled atop of the Jacobs School of Engineering. Falling Star, while most renowned for being a creative mastery of engineering and innovation, is as socially meaningful as it is a physical manifestation of the impossible. Suh envisioned this piece to not only challenge the conventional boundaries of architecture, but to articulate the way one cultivates social belonging when displaced. 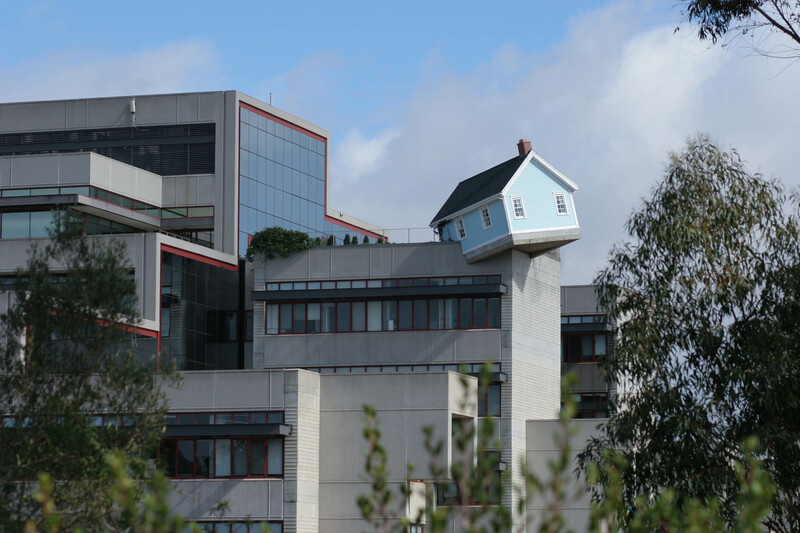 As an international student from South Korea, Suh translates his psychological experience of redefining home into a physically lopsided house, symbolizing the challenges international students face when reconstructing familiarity and belonging. Through this piece, Suh’s personal journey of displacement becomes a monument for the collective experience many UCSD students and global citizens face. Widely known as “the shortcut from the north side of campus to Warren Lecture Hall,” a closer look at the path reveals hexagonal scales, which from a panoramic vantage point resemble a serpent, winding themselves from the base of Geisel Library down to Warren Mall. A small garden of Eden rests in the middle of the path, adorned with fruits and a marbled bench quoting Thomas Gray. Further down, a large, inscribed “Paradise Lost” installation looms over the path. Convenient for the pedestrian, Snake Path does more than just help students cut across campus, but poses a question that disrupts the balance of intellect, innocence and education. Smith curates this piece with the intent to comment on creating thinkers, not just products of a confined education system. Situated high above PC’s hub of food, students and activity is a mural installation of two clocks, surrounded by quotes: “another day, another night, another idea, another dream, another song, another fear, another job, another exam, another smile, another book, another sweater, another car, another love, another life.” Easily mistaken as just another wall in PC, Kruger’s message is not to be missed. Another quote suggests that our lifetimes, and especially so as students, have become measured, not necessarily in experiences, but in repeated moments and growing pains that accompany university life. It challenges our use of time, and pushes back against the idea that the moments we have are not savored, but merely markings of the next “to-do” in life. Similarly to Kruger’s exhibit, Another, Baldessari’s addition to the entrance of Geisel, aims at revolutionizing what students are capable of in the mundane of routines. With the central library known as a hub of laborious study, Baldessari’s bold “read, write, think, dream” statement redefines Geisel to symbolize a place of thoughtful evolution and idealistic progressivism where the student is considered to be much more than one who absorbs information only to spit it out again on a blue book. Simple yet imploring the profound, Baldessari’s piece, much like the others — renowned or unfortunately passed by — curates an atmosphere on campus where the students are more than the university culture might define their identities to be.